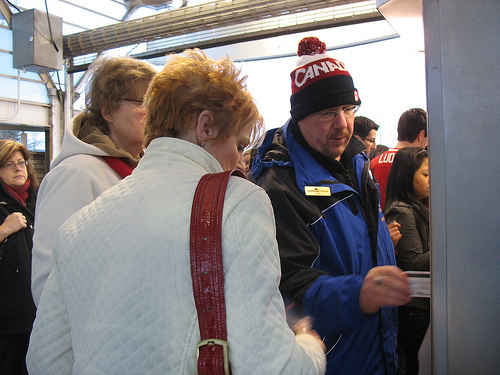 The Buzzer blog » All aboard the West Coast Express (there’s extra trips for the Olympics)! All aboard the West Coast Express (there’s extra trips for the Olympics)! The 6 a.m. West Coast Express train parked at Mission City Station. 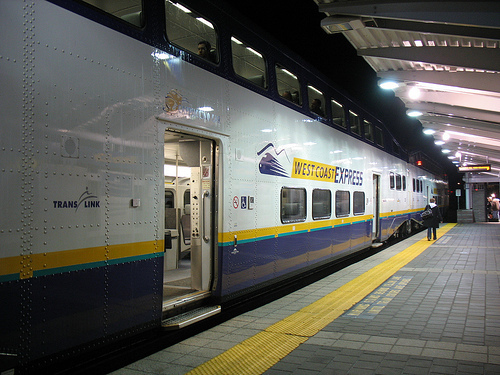 I got up in the wee hours of Monday morning to ride the West Coast Express (WCE) into downtown Vancouver from Mission, B.C.! 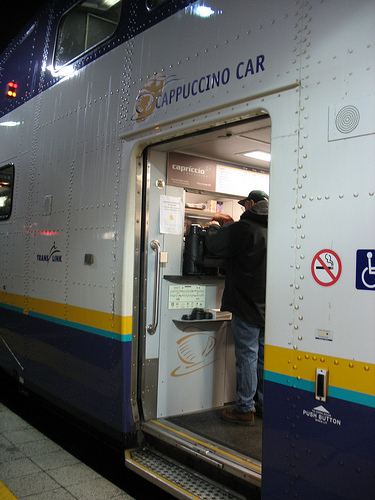 WCE customers just love the service—it’s a cushy, two-level train with incredibly friendly staff and terrific amenities (a cappuccino car, and bathrooms!) It costs a bit more to ride, but you should certainly give it a try: just be aware that it only goes one direction in the morning, and one direction in the afternoon. It’s not constantly running on its route like the SkyTrain! Anyway, for the Games period, WCE is running an unprecedented number of extra trips to accommodate extra crowds. On top of its existing five morning and five afternoon trips, they’ve added six new trips on weekdays, nine new trips on Saturdays and seven new trips on Sundays—they’ve essentially doubled their service. Let’s take a look at what WCE is like, visit a few stations, and see what staff are doing to bring you the extra Games trips. 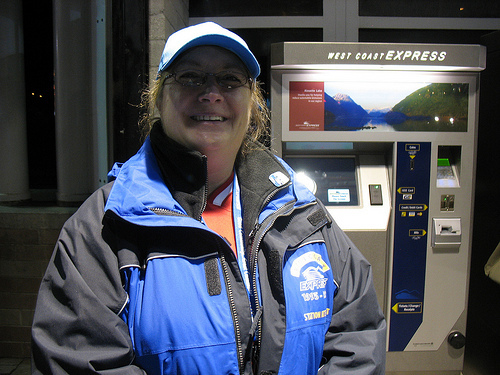 Deborah, one of the West Coast Express station attendants. I rideshared out to WCE’s Mission City Station with Jackson, a videographer who’s doing an employee video for West Coast Express. We captured the West Coast Express 6:30 train coming into the station – hardly anyone was out there for the early run at the end of the line! The Olympics are certainly boosting ridership. Deborah worked over the weekend, and one of the runs on Saturday was completely full—hundreds got on at Mission City, and the train went into Waterfront with roughly 1500 people on board. The new service for the Olympics is roughly 2.5 times the normal West Coast Express schedule. The extended service was worked out in conjuction with Canadian Pacific Railways (CP), who owns the tracks that WCE runs on and provides WCE with track time and train engineers. CP, who is also an Olympic sponsor, donated the track time and the crews to extend WCE service for the Games. If you like the extra service and think you’ll use it, WCE would love to know about it! 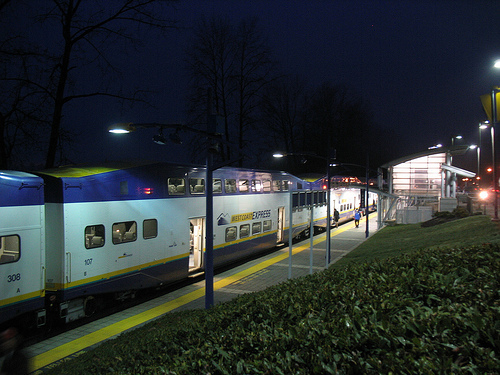 The West Coast Express at Port Haney Station. For its service, WCE has five trains, which have a different number of cars. There’s one four-car train, two seven-car trains, and two nine-car trains. A car can take about 146 passengers seated, but can carry about twice that when full. 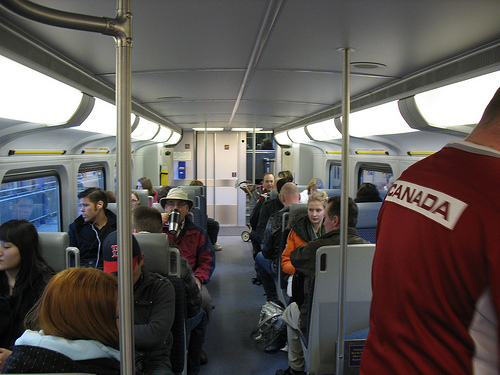 The longer trains are doing many of the extra runs during the Games. However, since WCE service usually ends at 7:30 p.m., but is running until 2 a.m. for the Games, that’s meant some shifting behind the scenes. Since service has to start by 4 a.m., maintenance time has shrunk to a scant two hours for the last train in—and each train needs cleaning, fixing, and a regulated inspection every day. Maintenance procedures have had to change to accommodate the shorter times. Burt, a West Coast Express station attendant. 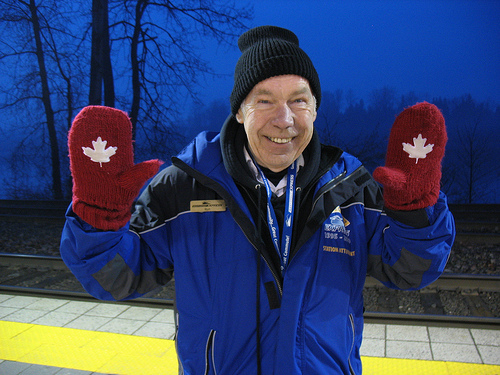 Burt, a four-year WCE station attendant, was at Port Haney Station wearing his Olympic mittens! 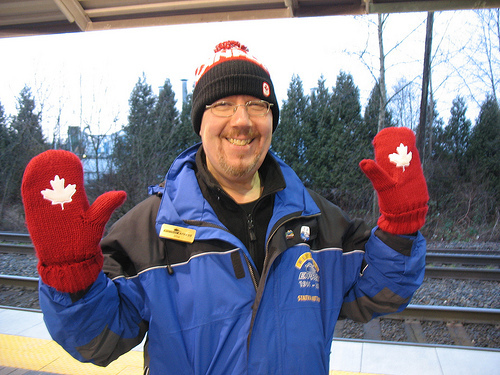 He’s a former transit operator out of Port Coquitlam and was quite enjoying himself out on the platform. 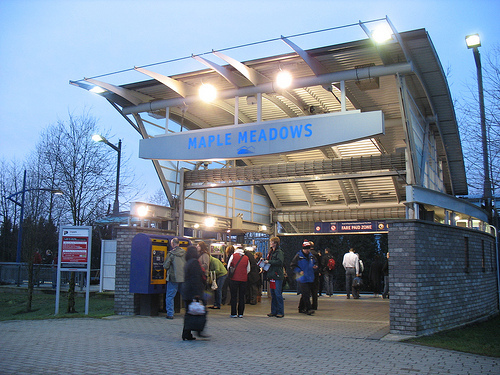 At Maple Meadows Station, the platform was getting busy. We were getting down to the later train departures for the morning, which are showing up as the most crowded during the Olympic period. When I rode the last train out, 1,460 people were on board—a 30 per cent increase! Mike, a West Coast Express attendant at Maple Meadows. Mike helping out some new riders buy tickets for West Coast Express. 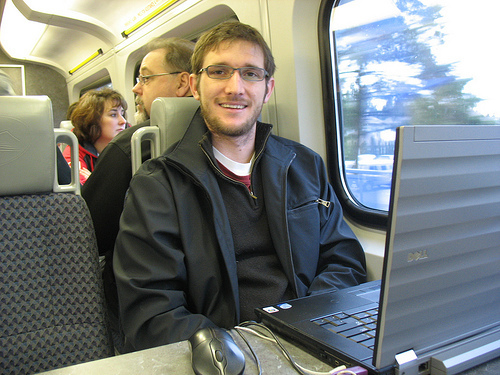 Mike also worked Saturday when big crowds arrived to take the train. Freight trains blowing by the station! I should mention that since WCE shares the tracks with CP, freight trains can come whooshing through the station at an incredibly rapid pace. It’s so strange after coming from something like the SkyTrain system — you never see other trains running in between them! Anyway, heed the warning to stay behind the yellow line—they’re terrifyingly fast! Here is a video of a freight train going through Maple Meadows Station! And here is a video of a WCE train arriving at Maple Meadows Station! 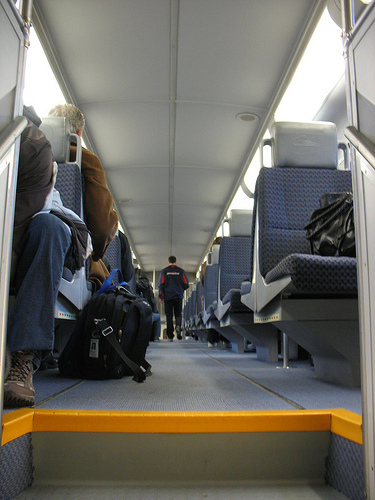 The lower level of a WCE train car. I got on at Maple Meadows Station and headed in to downtown Vancouver. The interior of a WCE car reminded me very much of commuter rail in Europe or Chicago – quiet interiors, comfortable seats facing one another, and two levels of seats to sit on. The upper level of a WCE train car. I had to sit on the upper level though. (I always love the upper decks of buses and trains!) The upper level of the WCE train car had more seats facing each other, and tables with electrical outlets every second seat or so. Jason, a regular WCE rider. I spoke to Jason, a regular WCE rider working on his laptop at one of the tables. He said he hadn’t noticed Olympic crowds yet, but was planning to work from home over the next few days to avoid the rush. Chris and Patty, Seattle residents who are here for the Games and staying in Maple Ridge. 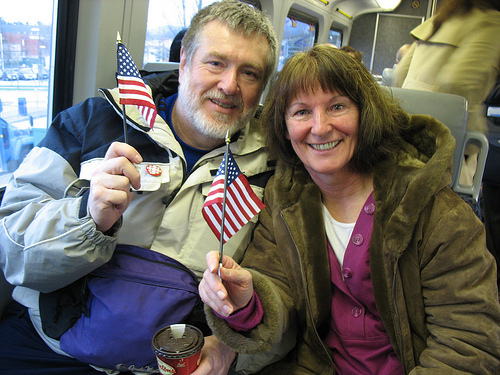 And I spoke to Chris and Patty, residents of Seattle who were here for the Games and really enthusiastic about our public transit system :) They’re renting a room in Maple Ridge and using West Coast Express to get to the Olympics during the day. Apparently they found that hotel rooms were $500-$700 a night along the SkyTrain route, with a minimum booking of seven days! The crowds pouring off the last regular morning train, arriving at Waterfront at 8:40 a.m.
Quite seriously, if the service was offered in my area, I would be on the train in a flash! Thanks for the ride, West Coast Express! Just two more people to mention: I dropped by the West Coast Express office on the third floor of Waterfront Station. Say hello to Heather, from customer service at WCE, who has been patiently fielding calls from new folks discovering the service, and regular riders who want to confirm how their service will run during the Games! 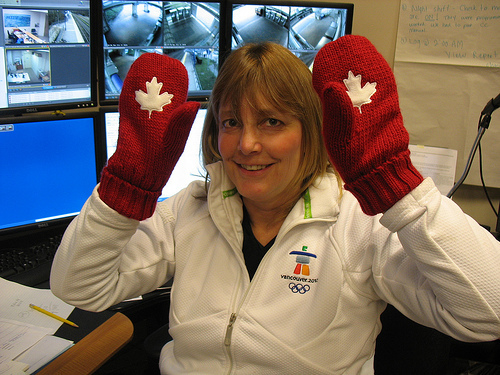 And here is Lil, WCE’s systems monitor who works in their control room. 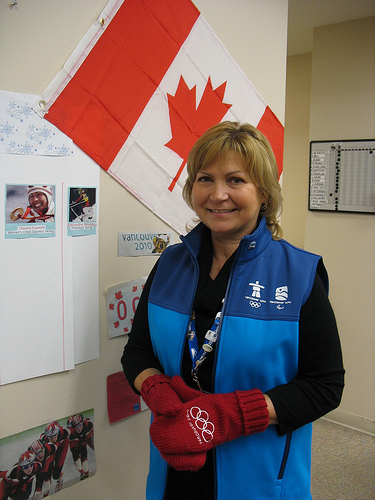 She was instrumental in putting together the extra service provided for the Games — thanks Lil! Happy 15th birthday, West Coast Express! The West Coast Express website is moving to TransLink.ca! I moved to Maple Ridge in December and now use the WCE daily. it is simply amazing. So relaxing. I don’t even mind the added time to my commute now. Since the olympics started there are a LOT more people. By the time the train arrived at Waterfront this morning (Train 4 at 8:08am) It was full of people standing. I LOVE the fact that there are later trains running right now. I hope that eventually it will be this way all the time. I LOVE the new late night trips! They’re a life saver and it cuts the time spent on transit in half! 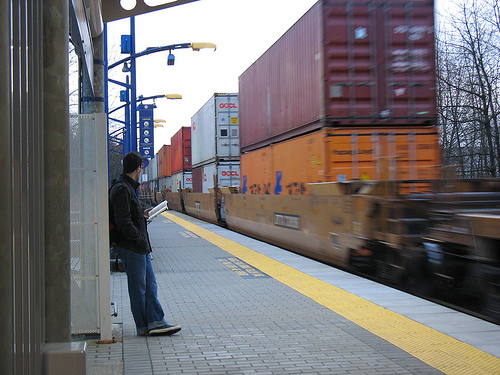 If you think the trains going through the station are fast and terrifying, you should be in Coquitlam Central or Port Moody stations when a freight train comes to a stop and reverses while within the station area. The sound of all the cars piling up on one another (as the train stops) is deafening but is really cool to hear as the sound goes from one end of the train to another in sequence. This happens quite regularly at these stations. I live in Maple Ridge and work in Mission. I ended up taking the train from Mission twice and once from Port Haney to the Olympics during the additional times. The trains I rode on were always clean and punctual. The staff and police officers on the trains were always friendly and helpful. I loved extra trains and would take them downtown more often, if you guys would offer these runs every 2 or 3 hours during the week and weekends. Just like the Gotrain in Toronto but be sure to have a late train for all those night owls and club goers! Keep up the good work West Coast Express! I went on the West Coast Express for the first time on July 28th just for fun, and to say to some of my friends that I have been on the West Coast Express. The trains are very nice are the ride was very smooth and comfortable, and the air condition on board the trains made the ride a pleasure. There were also nice views of the Burrard Inlet during the journey. 1) Why are the trains only one way? I wanted to go all the way to Mission then head back to Waterfront the same day but I was told that I would have to stay overnight if I went all the way to Mission, so I ended up getting off at Poco and took the skytrain back to waterfront. 2) Who were the trains built by? 3) Why does this service cost more then other transit services? 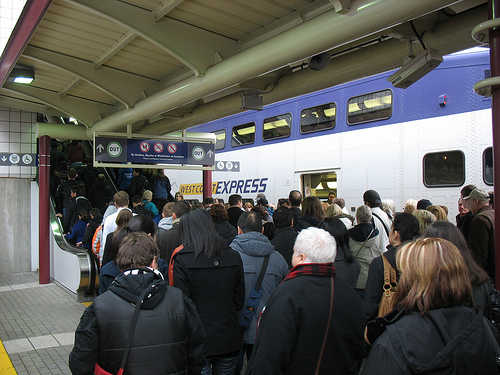 4) Are the West Coast Express one way tickets valid for the transit pass income tax return? 5) Why don’t FastTrax holders get a discount on one way West Coast Express fares? The WCE is one way to serve Fraser Valley commuters and reduce congestion on the Lougheed and Hwy 1. If you do find yourself in Mission, you can take the Greyhound back. Many did this when WCE first started operations many years ago. 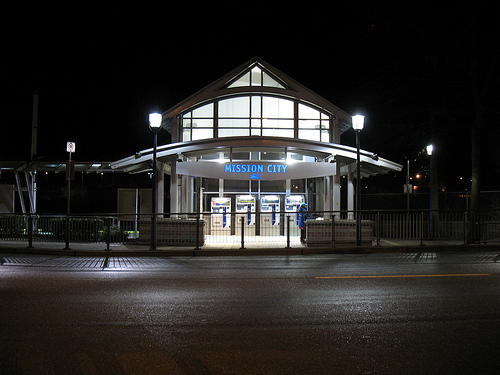 As you discovered, you can turnback at one of the tri-City stations to ride the regular transit back to the city. Ric: Here are the responses from West Coast Express. The train service was developed to serve the commuting public – bringing them into the city in the morning and taking them home at night. Hopefully someday in the near future we will be able to offer service in both directions throughout the day. The commuter service travels much farther than most other transit services and provides additional amenities that are not available on other parts of transit. The government only offers a tax break on our weekly and 28 day tickets. They don’t offer a tax refund for one way bus tickets either. TransLink only offers a 28 day FastTrax pass for West Coast – probably because they are assuming that if a student is commuting to school – they will only need a pass. The discount on the pass is significant enough that if someone is traveling Monday to Friday they will easily make up the amount the pass costs.